The ruins of an old gunpowder factory during the world wars is what you see left scattered around in fields and woods in the quiet West TN neighborhood but it’s what you can’t see that draws investigators to the area. 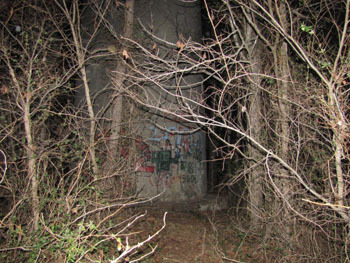 Legends of a deadly plane crash or the underground tunnels being the last resting place for victims of a wondering mass murder or the reports of the Satan worshipping that possible continues today is what’s fueling this location paranormal experiences making it a hot spot for local investigators. Many legends surround this area, however the only truth we could find was that the ruins that are found throughout the woods and the smoke stacks themselves are from a gun factory in the 1940s. The build did experience an explosion that claimed the life of one employee. There also was a plane crash nearby in 1944 where 9 of the 10 crew members lost their lives. From our time spent here that doesn’t seem to be the only terrible history connected to this location. I really feel that this is one past that only the spirits could truly tell.